The author was an extraordinary man who had a number of significant careers. This book is the third reprint, and the first in this format, of a book first published in 1953. The story is unique but was written before the author became a Minister of the British Government and was murdered by an IRA bomber. DESCRIPTION: The author was an extraordinary man who had a number of significant careers. This book is the third reprint, and the first in this format, of a book originally published in 1953. The story is unique but was written before the author became a Minister of the British Government and was murdered by an IRA bomber. Airey Neave trained as a lawyer, joined the Territorial Army volunteers as an artillery officer and was sent to France following the outbreak of war in 1939. He formed part of the rear guard at Calais, where he was wounded and taken prisoner. From that point he became dedicated to escape. After one escape he was held for a time by the Gestapo who threatened to shoot him as a spy. He was then transferred back the German Army POW program and sent to the ‘escape proof’ Colditz Castle. There he became the first British POW to make a ‘home run’, teamed with a Dutch officer. He reached Switzerland and was then sent down the escape line through Unoccupied Vichy France, Spain Gibraltar and back to Britain. Safely in Britain he began his next career as a senior member of MI9, responsible for supporting the evader lines in Belgium and France that brought more than 3,000 escaping POWs and evading downed airmen, commandoes and sailors safely out of Occupied Europe to Britain to fight again. In 1945, he began a new career as a prosecutor bringing German War Criminals to court at Nuremburg. 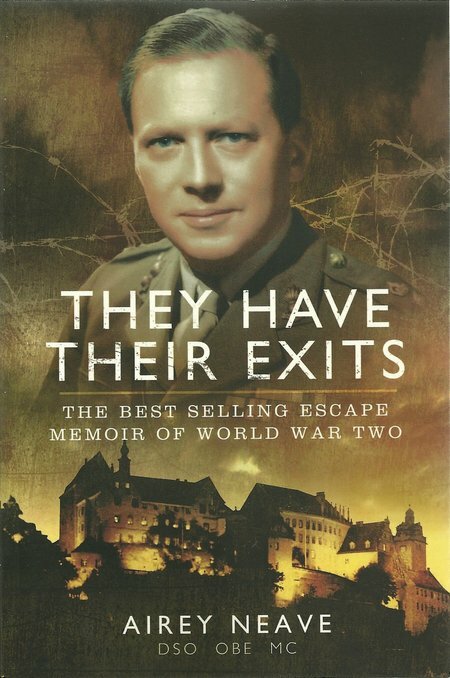 This book principally covers his home run from Colditz and his experiences interviewing senior Nazis and serving court papers on them. At the time when the author wrote his memoirs, his work in MI9 was still very sensitive, not least because the French Resistance fighters were caught up in the complex political turmoil that characterized France after liberation. Partly because of this, the author decided to change the names of people who helped him to make his way from Switzerland via Vichy France and Spain to Gibraltar. This is an inspiring story told well by the principle player. It is a great tragedy that his later political career was terminated by his murder. He was already strongly making his mark in politics and would have continued to provide his support to the Thatcher Government as it attempted to halt the managed decline of Great Britain that had been begun by Atlee’s National Socialist Government which took office after the end of WWII. The fascinating text is supported by maps, plans and a monochrome plate section. A highly recommended book that reads like a good thriller and tells a true story that is almost beyond fiction. The same publisher has also just published a book written by Col Langley, Neave’s friend and boss at MI9. A combination of a very heavy workload after 1945 with the growing interest in politics and the continuing sensitivity of much of the work of MI9 prevented Neave writing about some of the events he was directly involved in from 1944 within this book or attempting a follow up book on his later experiences. As a result, there is a very brief account of his part in Normandy and then in the Netherlands assisting the escape of paratroops, particularly in the exfiltration of surviving paratroops from Arnhem. This book is also a reminder of how far the quality of politicians has fallen since days of Airey Neave, when politics was still about conviction and service.